Wishing you a wonderful God-filled Christmas season with your loved ones. I wish you and yours a very Merry Christmas and a Happy, Healthy and Prosperous New Year. Merry Christmas to Erik, your family and all of our Amish America family!! Wishing health and happiness to you all! Will be going to church with her and spending time with family. In Poland the “2nd day” of Christmas is observed, so most places will be closed the 26th. Wishing you and your family the best of holidays together. Tell the family we all said hi. Loretta, I’ll do my duty! Carp is usually served a couple ways on Christmas Eve. Fried, and “w galarecie”, which is in gelatin with some peas and carrots and other things thrown in. I don’t mess around with that version, to me anything in Jell-O needs to be sweet and called “dessert”. The friend version is not bad, but you have to watch the bones. I hope to make it another year in a row without choking. Merry Christmas to you too, Erik! I hope you have a wonderful weekend filled with many happy moments! 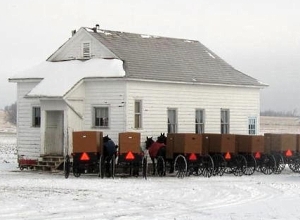 I love the Amish Christmas post with the picture riding along in the snow, passangers bundled up:) My grandfather had a sleigh that we rode in at Christmas time. Great fun and good memories!! Thanks Beth, see my above comment on the carp 🙂 I remember I told an Amishman once about this tradition, and he was bemused–told me they consider carp “junk fish” that you throw back. Reminds me how, I think it’s Greeks(? ), supposedly find pickled Polish dishes like pickled cabbage repulsive. I wonder if the perception of carp is more cultural or if there’s something more to it. No idea how the tradition started in Poland, but it is going strong. They sell them live in big tubs in the outdoor markets every year. You buy one, keep it in your bathtub until the appointed hour, and then boom. That’s at least the classic way of doing the deed. Then you turn it into an edible dish. I’ve never been privy to the process and I am sure a lot of people just buy the already-dead version. Christmas Eve aside, I don’t think anyone here touches the stuff the rest of the year. Merry Christmas to you , Eric, and everyone at Amish America! Have a safe and enjoyable trip! Merry Christmas Erik ! Enjoy your holidays and hope you have safe travels ! Merry Christmas Eric – we won’t be eating carp here in Northern Vermont, but since my wife is Polish, we will begin our Christmas Eve celebration with the breaking and sharing of the Oplatki (Polish wafer). I’m sure your grandmother is very familiar with the tradition. Dave, we will be doing the same tomorrow evening, with my Grandma, aunt, uncle and cousins. I know it well. Nice to hear it happening in Vermont! I hadn’t heard of much Polish population there. George, on carp, see my couple of comments above. I take it by my Amish acquaintance’s reaction, that they probably don’t. Do you have a translation for this? Do I see “Christ” and “New Year”? “Happy Christmas and New Year” maybe? Thanks for sharing this! Merry Christmas to Erik and everyone on Amish America. Thank you for all the wonderful pictures, every day life experiences and history of these wonderful communities. Have a safe trip Erik! Erik and fellow Amish America fans: here’s wishing you happy and peaceful holiday season. May you be well, happy and peaceful in the new year, 2012. Being of Polish (also German) extraction, we, too used to do the whole “blessing” with Oplatki. My own family didn’t celebrate Wiegelia (?–my Polish is nearly non-existant! ), but my Aunt did, with the straw under the tablecloth, fish (probably not carp, but you never know), empty chair, midnight Mass, etc. In my own family, for the past 52 (as of tomorrow) years, we’ve done our main “celelbrating” on Christmas Eve, my nephew’s birthday. He repairs (and drives) busses, so he takes a busload of us (family & friends) on an evening tour of holiday lights—sometimes into Chicago (Navy Pier, State Street, the Magnificent Mile), other times in the suburbs. We eat & exhange gifts before the bus ride, then afterwards, have birthday cake. It’s a unique holiday tradition, I think, and usually lots of fun! Enjoy your truly Polish Christmas, Erik, and greetings to your grandma—both of mine passed away by the time I was 8, so I hope (I think I know you do!) you appreciate your grandma and treasure the time you spend together. Hi Alice Mary, you are almost right–“Wigilia” is how it’s spelled, and pronounced “Vee-gee-lee-ah”…and sounds wonderful, the tradition you have, by the way! I have family in Chicago–if you’re of Polish background, you almost have to, I think–and have visited a number of times. I bet that is something. And visiting grandma, I do treasure each year we get to do this, and glad that she is still going well. I am in Poland for about another month, but then back to the US in February–NC, PA and who knows where else! Happy Christmas and Blessed New Year to you! I get the carp thing…my dad loves his lutefisk and lefse. I think lutefisk is most disgusting, can’t stomach that even once a year! I do love the lefse though with some brown sugar and melted butter…YUMMMY!!! herring, lefse (potato fry bread),sweet soup,etc. took place in an Amish settlement. You can read it at mennoweekly.org and then go to the Dec. 12 issue in the archives. Christina, Al, nice, you posted almost simultaneously on Scandinavian Christmas–I too don’t know about lutefisk but the lefse sounds like it could be something great. I have been reading about how Norway has been having a butter shortage, throwing a wrench into holiday recipes calling for butter. I saw a photo somewhere online of Norwegians lining up down the block to buy the stuff. I had to scratch my head on that one. Norway I think is the richest, or at least top 3 or so, countries in the world? I didn’t really read into the explanation for why it happened, but how odd. Merry Christmas to Erik and all the Amish America readers! I will go to church and then spend time with two legged and four legged friends. And oh yes, eat some yummy Amish treats sent to me by my friends in Lancaster County. MERRY CHRISTMAS TO YOU TOO ERIK…..AND SEND US SOME OF YOUR GRANDMA’S RECIPES….BUT NOT THE CARP THO 🙂 ARE YOUR PARENT THERE TOO ? LOVE YOUR ARTICLES AND PICTURES….SOME PICTURES OF POLAND WOULD BE GREAT TOO….ANY AMISH THERE ????? I WILL BE HAVING THE KENTUCKY TRADITIONAL HAM & TURKEY AND ALL THE TRIMMINGS….FRIEND FROM MICH.ARE HERE….SO WE DO THE TURKEY TOO….AND OF COURSE I WILL MAKE THE HOMEMADE STUFFING AND MY JELLO SALAD THAT I ONLY MAKE ONCE A YEAR….. Still need the EDIT BUTTON on here…I left out the s on parent….suppose to be parents….and I did reread it before I hit the submit button…..mistakes just doesn’t pop out like they do when you use the EDIT BUTTON…..think you can get us one ????? Merry Christmas Erik, and to all your readers as well! We are very grateful for your support this year. Enjoy your Christmas in Warsaw and stay warm! Wishing everyone on Amish America, and especially Erik, a Merry Christmas with all the traditional goodies, of your family, and wish all well. Our family is scattered around Florida, and in Virginia, but we see each other when we can. The early days, were celebrated with large tables, with family gathered around, on whichever day, everyone could get together, and we had the “country-type” fare, which was very much like the Amish spread! After all, my parents came from Tennessee and Georgia, so when they migrated to Florida, the “traditions” came with them! Our tables would always be full of Turkey, Dressing (or Stuffing), Ham, Mashed Potatoes, Green Beans, Broccoli casserole, or other veggies, Sweet Potato Souffle’, Cranberry Sauce or Salad, Deviled Eggs, Florida Ambrosia(oranges/pineapple,coconut), Dinner rolls, butter, Pumpkin Pie, pecan Pie, cookies, and whatever anyone else decided to bring!! WOW….and the waistlines always expanded on the holidays!!! BUT sure was yummy!! And at one of my aunt’s house’s, the dinner was served around noon, but throughout the afternoon, family and friends, came to visit, and cycled through, helping themselves to the never ending food, on the dining table, for the rest of the day!!! There was always enough food, to feed everyone! (always amazed me!). And being in Florida, there was no snow or sleigh rides, but waking early, to see what was under the Christmas tree and trying out those bicycles or wagons, in our pajamas, early in the morning, was always a sight to see! Nowadays, our family celebrates with our 2 children and their families (3 grandchildren), with pretty much the same foods, but still not like “momma used to make”; after all, each generation sets their own traditions, which is fine……still kinda miss the those bygone days, though….But we are thankful for what we have and who we have left, to share this blessed day. Have a safe weekend, everyone! Merry Christmas to Erik, and all the loyal readers! Wesołych Świąt Erik, and a Merry Christmas to all. I wanted to take a moment and say Merry Christmas to the gang at Amish America. We as a family like fish, but carp is rare in our diet, I know people who cringe at the idea that I like sardines. I would like to wish everyone in this wonderful online community a joyous, serene and blessed Christmas. I extend warm wishes as well to any Amish or Mennonite readers here, hoping that the Christ Child will continue to bless you and your families in the New Year. God bless! Your Christmas sounds so very interesting, Erik. I’d love to experience a Polish Christmas someday! My grandparents are from Poland. They came here in the early 1900’s. Their last name was Zabrowski, but the immigration officers at Ellis Island changed their name because they said it was too difficult to pronounce. I don’t recall much about the Polish Christmases that we’d have at relative’s homes back when I was a child. I remember some noodles with poppy seeds and that was about it. It’s sad how many traditions are lost when in a big country like this. That’s why I admire those who are able to keep with tradition like the Amish. Wish you a Merry Christmas and a Happy New Year Erik! Sorry, I was down with bronchitis for awhile and then had to play catch up with shopping, baking, etc., so was unable to get online for a few weeks…. But just wanted to say I hope everyone had a very nice Christmas, and will enjoy a happy, healthy, and blessed New Year! Well, Lisa on AA taught me the Twelve Days of Christmas start on Dec. 25, so techinically, I’m not too late in that respect to wish everyone a blessed Christmas as we reflect on Christ’s birth, the wonder of it all, the fulfillment of prophecy, and His path to the cross, which was why God became man-to reconcile us to Himself. Merry Christmas,& God Bless us Everyone! Erik, wishing you and everyone here on Amish America a very Merry Christmas and Happy New Year. Wish I could go to Poland as I have a very dear penpal there. Would LOVE to see pictures and also have family recipes (no carp) on here. Wishing you a safe trip and a happy one with your family. Hi, I enjoyed reading about your Wigilia. We are here in Huntsville Alabama and our Polish Club is going strong. Tomorrow 50+ people at Good Shepard Catholic Church we will celebrate Wigilia-our meatless meal. This will be my first one with real Polish People. I cooked it here at home, and turned around and cooked a Christmas meal on Christmas Day. (my son wanted an American meal) too much. A belated Thank-you Frances. Hope your Wigilia meal was enjoyable. I I know carp is not high on the list of favorite fish in the US but it is still going strong for the Christmas Eve dinner in Poland. Have fun with your family and enjoy your carp…..one thing I can not eat…..catfish is another one….I’ll take the cod or perch or orange roughy anytime….love fish…but can’t seem to find it here unless it comes from china…..and I won’t buy it….it’s a shame as much fishing is done in the states, that we have to buy fish from china !!!!! If any of your readers know where to find fish in the states in chain stores in Ohio, I’d love to know….not close to many chain stores….except Walmart & Kroger….to go to larger stores is almost an hr. away….. So how long are you going to be in Poland ? Send pictures, would love to see them….. what is the temp. there? It is 32 here today….don’t think we are going to have a white Christmas….